differencemakers community blog: What is the Quality of Your Actions? In general, Actions follow Thought and Intent. 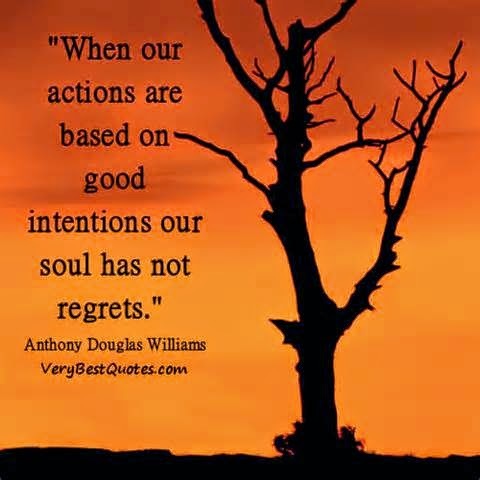 It is not actions that create what you want, but your intent. Thought creates the content, intent creates the context. This is also explained in another article on 'The Content's Fine, but Intent is the King' . If the thought and intent are self-serving, then the actions have only a limited impact. These actions may at best invigorate others in believing and investing in you to create wealth/ wellness once they are convinced that you have the competence and the character to achieve those results. At worst, they will breed tyranny and dictatorship. If the thought and intent are directed to influence others, it can translate in creating leaders for a short term, based on what the 'followers' perceive of the so called leader. Such individuals also need to have the charisma to pull the others towards them. Most charismatic leaders fall in this category. However, if the thought and intent behind the action are to co-create and contribute towards the long term value of the Society/Nation, such individuals have to actually rise above themselves and inspire others to create a culture where such values are replicated so that the effort gets multiplied and becomes long lasting and sustainable. Interestingly, the three categories of intents correspond to the 3 Circles explained in another post. To achieve the highest quality of Action is a difficult process, no less than deep meditation, aided by strong sense of purpose, self belief and regular practice.People who have practised this and succeeded in creating powerful actions and inspiring millions include Mahatma Gandhi, Martin Luther King and Nelson Mandela. Often, leaders get wrongly motivated by these examples and try to create actions based on the followership they want. This is the wrong way. Instead, leaders must focus on the change that they wish to create and channelise their thoughts and intent towards creating the change through their actions. Whether or not the canvas is large enough, is then secondary. You will get what you have set out to achieve, and that alone should give you all the satisfaction.